The 2018 CAPHC Annual Conference was once again a great success, welcoming almost 400 individuals from across the child and youth healthcare community. Always a big part of our annual event, the 2018 Poster Fair did not disappoint, showcasing more 100 inspiring projects and initiative from across Canada. This year we had 135 abstract submissions of which we accepted 100. These 100 posters then submitted images of their posters which were judged for the purpose of picking a winner in each category. In previous years authors submitted to one of 4 categories. Feedback from previous years resulted in a change in process where authors now submit to one of two categories: Demonstration Posters, and, Scientific and Quality Improvement Posters. The Scientific and Quality Improvement Poster category is reserved for posters presenting completed projects/initiatives, with realized outcomes. Posters in this category should be able to demonstrate rigorous scientific or quality improvement methodology and significant results. Also, conclusions drawn must be supported by the evidence presented. 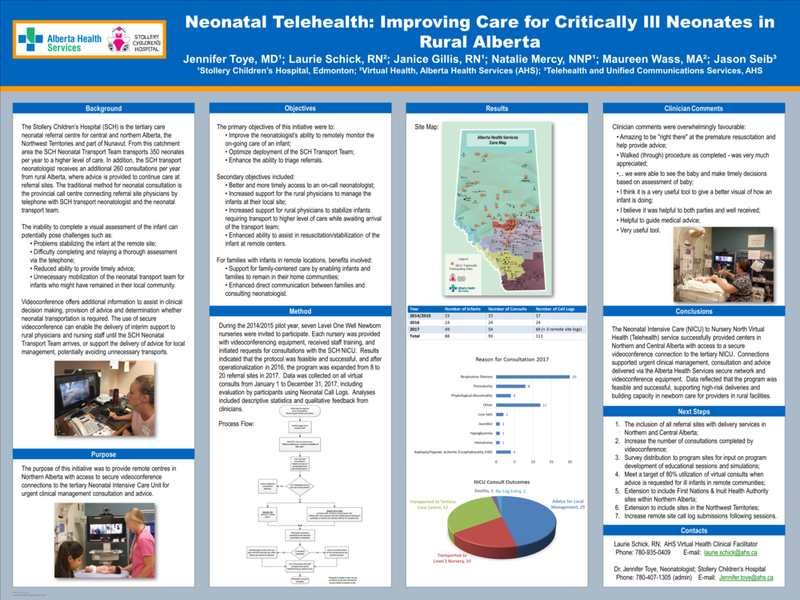 The Demonstration Poster category is for posters that share unique programs, intervention, initiatives, that will be of interest to the child and youth health care community, but do not benefit from rigorous analysis or evaluation. Posters are expected to demonstrate completed work. Stollery Children's Hospital, Alberta Health Services.